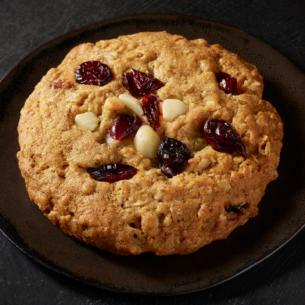 Our vegan cookie includes oatmeal, macadamia nuts, almonds and coconut plus the delightful tang of dried cranberries. Scrumptious on its own and even better alongside a cup of coffee or tea. enriched wheat flour ([flour, niacin, reduced iron, ascorbic acid, thiamine mononitrate, riboflavin, folic acid], [flour, ascorbic acid [dough conditioner], niacin, reduced iron, thiamine mononitrate, riboflavin, folic acid]), maple syrup, canola oil, rolled oats, cane sugar, almonds, macadamia nuts, dry cranberries (cranberries, sugar, sunflower oil), coconut, pumpkin seeds, almond flour, orange zest (orange peel, sugar, orange oil), natural flavor, flaxseed meal, lemon zest (lemon peel, sugar, lemon oil), baking soda, salt.